Here at Team Hutchinson Ford we recognise that when you are buying a car one of the most important decisions you can make is how you will finance it. 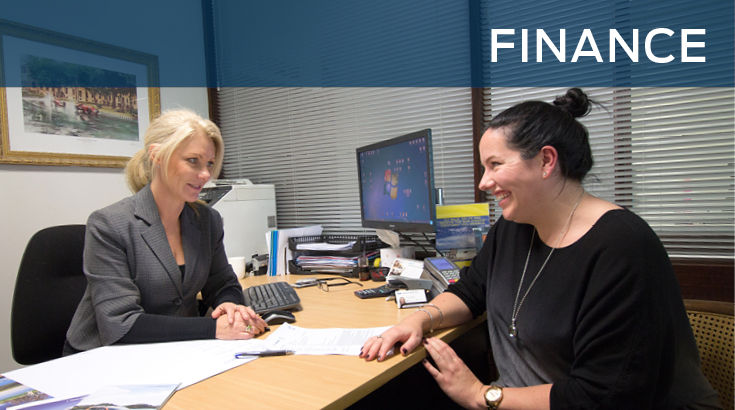 We can provide you with finance options personalised to suit your own individual requirements. When you park your new car in your driveway, you want the satisfaction of owning it and the confidence of knowing that you have purchased it via a finance plan that you can afford. Our experienced and approachable finance team understand the excitement you feel when buying a new or used car – we’ve all had that same feeling! We'll take the time to discuss your individual needs, requirements, and circumstances to tailor-make a finance and can also include an insurance package that is the absolute 'best fit' for you. Our goal is the same as yours - to help you get into the vehicle you want when you want it, working with you to make your finance a simple and painless process. Contact Deb Thompson-Bee, our Finance Manager via email or on 03 374 2620 to discuss your options over the phone, or make an appointment to meet at our showroom for a coffee and a chat. Whether purchasing for business or personal, we are here to make it easier for you.
" I have been part of the team at Team Hutchinson Ford now for over 7 years. How time flies. We are all about great service and providing a friendly atmosphere. From our coffee through to our welcoming helpful attitude we continue to strive to be the very best that we can be. I welcome your contact should you have any queries at all and can also arrange finance for your equipment and business assets as well, even a boat or caravan. I look forward to being of assistance to you." Our lending rates range from 9.95% to 13.95%. Rates vary depending on many factors including the amount of lending, the term of the loan, the level of deposit or equity in the loan, customer credit history, and customer risk profile. Finance terms and conditions together with information about the costs of borrowing, including credit fees, default fees, interest rates, and default interest rates can be viewed by clicking on the finance products button below.